I’ve had a bit of a nightmare with cameras over the last week or so after my beloved Nikon Coolpix S3100 decided to give up on me right before taking pictures for this blog post. Now it is in the camera hospital and is fortunately still under warranty so hopefully it will be fixed soon! After much thinking and constant research I decided after 6 years of wanting one, I’d finally take the plunge and purchase my first DSLR camera. I won’t ramble on about the camera just now, here’s my first blog post with my new camera! After a long and stressful day at uni I decided to head over to Argyle Street Topshop and treat myself to some new make-up. Normally I’d never buy this much but I had a £50 voucher from Christmas 2010 (no idea how I hadn’t spent it already) which had to be used up sooner or later so I decided to go crazy! I wasn’t entirely sure about the concept of a cream blush. 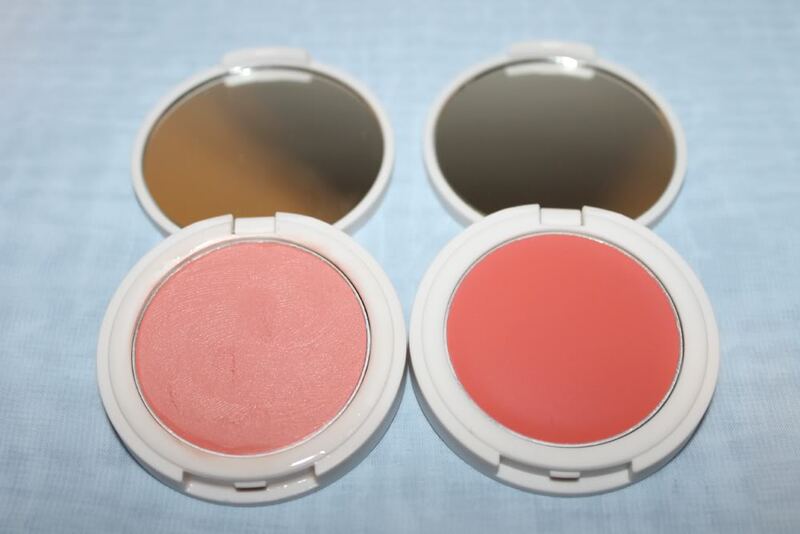 I have the Pop powder blush from Topshop which I really like and after hearing so many rave reviews on these two cream blushes I had to see what the fuss is about. I wasn’t expecting the formula to be cream to powder which was probably what put me off cream blushes in the first place so that was a nice surprise. They do apply very well but there’s always a slight fear that I’ll end up putting too much on! Would you recommend applying them with your hands or with a brush (if so what brush?) I’m really unsure! Aside from that they’re both lovely colours. 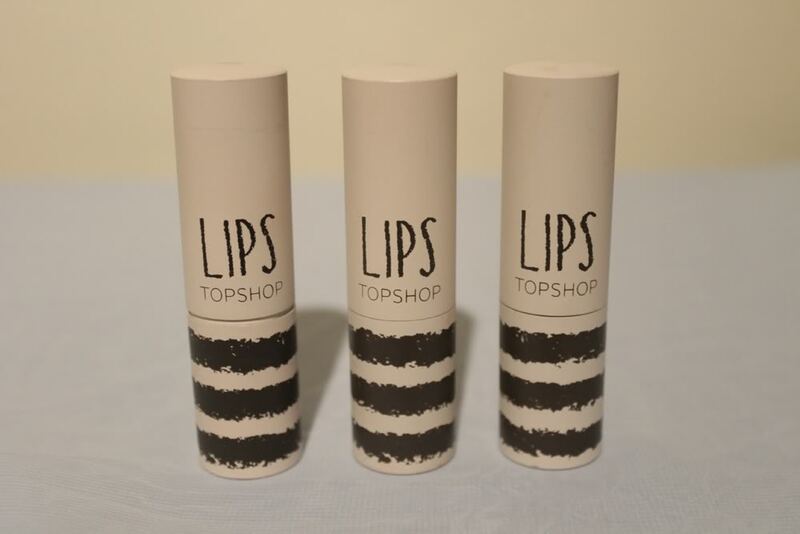 Where would a Topshop haul be without including some of their lipsticks? 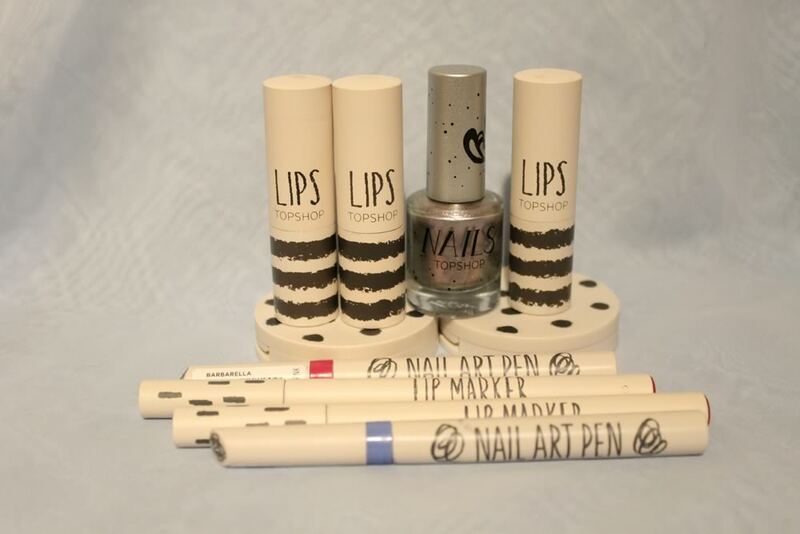 I decided to pick up these three shades to start off with. I’m not very into the whole dark lipstick look personally, I tend to stick to reds and pinks to be on the safe side. Rio Rio is a gorgeous satin matte shade which is a classic bright red, I don’t think you can go wrong with a classic red as they suit everyone. 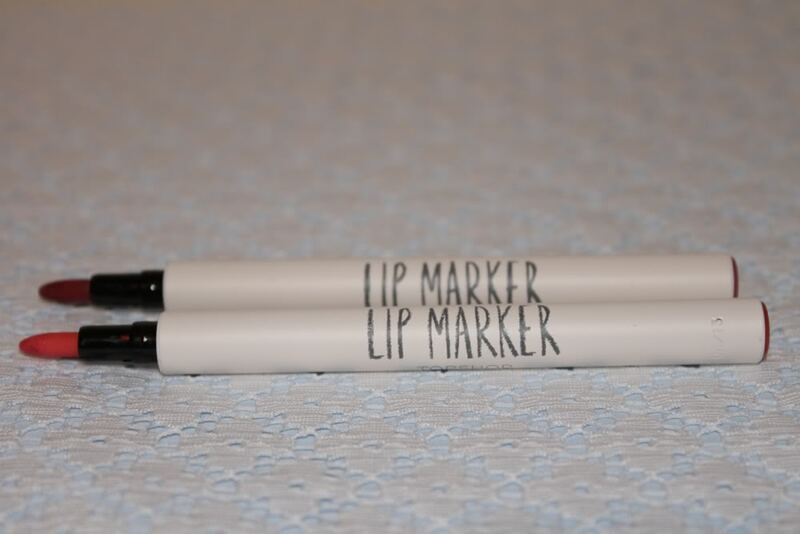 Next is Infared which is a velvet finish and kind of a cult product amongst bloggers. I wasn’t entirely sure about the shade at first as orange lipsticks can look a little bit unflattering at times but this lipstick looks great on me and everyone I’ve seen try it, definitely a fan! Last but not least, Innocent is also a velvet finish with a pale pink shade, a very natural pink shade that doesn’t wash you out and feels very moisturising so it’s perfect for everyday wear. The only negative thing I would say about Topshop lipsticks are that the colour labels on the products are a really inacurate indication of the colour, best to have a swatch on the testers before you buy them! I’m a big fan of lip stains. They’re great when you want a bit of long lasting colour on your lips without having to use lipstick and constantly check it hasn’t smudged all over your face! Hot Shot is a kind of deep pink shade and Parade is a classic red so I thought these two would be good to start off with. They apply so easily and the colour lasts for hours (which can be quite hard to get off mind!) but let me just say, they taste so good! I can sometimes find myself re applying them just for the taste, like a sugary sweet taste. I’d definitely recommend these. 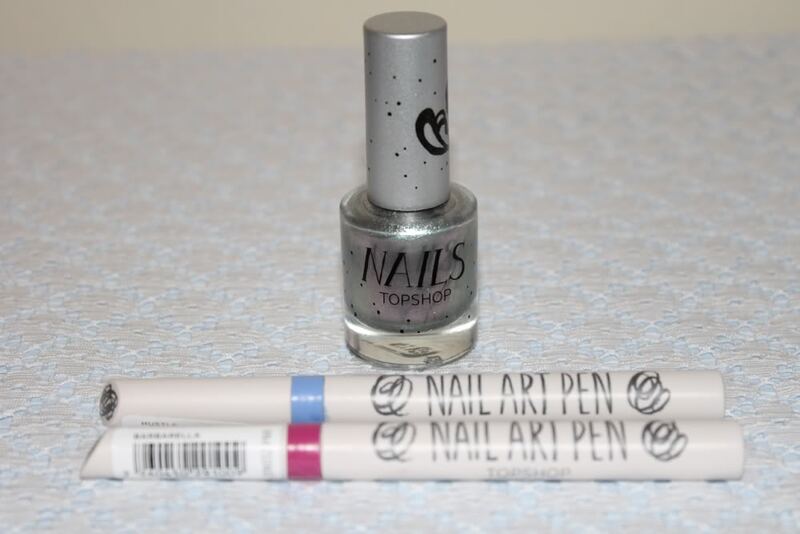 I have a bit of a nail polish addiction right now so I had to go get one of these. When I buy nail polish I only buy more expensive polishes when they are something you can’t get at a regular boots stall. After looking through all of the polishes I decided on Hypnotic which is a lovely silver shade with purple undertones when it hits the light. When I was looking through the other shades I noticed one shade exactly like Chanel Peridot which became even more interesting when the sales assistant told me Chanel actually makes Topshop makeup.. who knew? These are a new addition to Topshop’s makeup range as far as I know. They don’t have a ton of shades but I picked up a pink and blue to try them out and they work really well. They aren’t made of nail polish formula so if you make a mistake you can easily just wipe it off with water and start again. Barbarella shows up as a kind of neon-pink shade and Hustle is a royal blue shade. The only thing you need to make sure of doing is to apply a top coat of clear nail polish once you’ve finished your design. It was a bit soul destroying when I’d spent about 10-15 minutes drawing intricate designs on my nails, washed my hands and the whole thing washed off! This whole haul would have cost over £70, ouch! Having said that, you do get a lot for your money and the quality of the products are right up there with the big guys. If it’s true that Chanel does make it then I’d imagine the quality should be as it is!